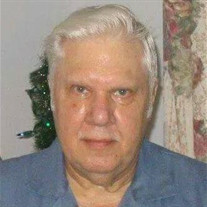 Paul Arthur Schutze, 77, of Hannibal, Mo. passed away at 1:15 p.m. Monday, May 15, 2017, at his home. Graveside services in honor of Paul and Shirley Schutze with full military honors provided by the Emmette J. Shields American Legion Post 55 will be held 2:00 p.m. Thursday, May 18, 2017, at Grand View Burial Park. Pastor Michael Neff will officiate. Paul was born on June 3, 1939, in Hannibal, Mo. the son of Paul William and Edith (Spencer) Schutze. preceded him in death on February 24, 2012. Survivors include one daughter, Tennille Freiburg and grandchildren, Shyann and Dalton Freiburg of New London, Mo; three sisters, Elsie Shroder (Alan) of Hannibal, Mo., Edith Sullivan (Dan) of Carl Junction, Mo. and Angie White of Hannibal, Mo. In addition to his parents and wife, Mr. Schutze was preceded in death by one brother, Vernon Couch. Paul proudly served his country in the Army during the Cuban Missile Crisis. During his time in the Army he was a Marksman trained in shooting a Hauser, along with being an Explosive Technician. After being honorably discharged from the Army, Paul went on to further his education and graduated from the Missouri Police Academy. He served as a Hannibal Police Officer and retired as the Hannibal Chief of Police in the late 1980's. Upon his retirement from the Hannibal Police Department, Paul went to work at (American Cyanamid) BASF as a Security Officer. Mr. Schutze's family was his pride and joy, especially his grandchildren. Before his wife's death, he enjoyed helping her with her daily needs. Paul was an avid Marksman, he enjoyed gardening, especially his tomatoes, or just enjoying a nice afternoon sitting in his garage watching the world go by. Paul was known for never meeting a stranger. Honorary pallbearers will be Shyann Freiburg, Dalton Freiburg, Greg Brumbaugh and Larry Wayne Brumbaugh. Memorial contributions may be made to the Mark Twain Disabled Hunt Program, in care of the Smith Funeral Home & Chapel.